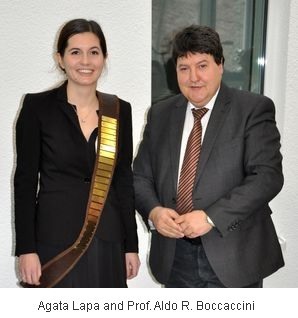 Lucideon is pleased to announce that Agata Lapa is the first to gain a PhD from the cohort of 15 researchers working in the Marie Skłodowska-Curie Innovative Training Network 'Drug-Free Antibacterial Hybrid Biopolymers for Medical Applications – HyMedPoly'. Entitled 'Bioactive Phosphate Glasses', Agata's thesis was carried out under academic supervision of Prof. Aldo R. Boccaccini of the Institute of Biomaterials at the Department of Materials Science and Engineering, University of Erlangen-Nuremberg, in collaboration with Lucideon's Dr Mark Cresswell and Dr Phil Jackson, who provided industrial supervision. Agata's work led to the development and characterization of new families of phosphate glasses incorporating metallic ions with antibacterial capability with a focus on the development of fibres for wound healing applications. Four papers from Agata's thesis are in advanced stage of preparation and will be submitted for publication in early 2019. "We congratulate Agata on her success. She carried out some outstanding research work during her 18 months with us. "The aim of the HyMedPoly project is to develop a new generation of professionals who will play a pivotal role in pushing forward new therapies based on drug-free antibacterial materials for the coming decades. Agata is an outstanding example of someone who is going to be leading the way in research of this kind. "We are proud to have worked with Agata and wish her every success for the future." To find out more about HyMedPoly visit www.hymedpoly.eu. HyMedPoly has received funding from the European Union's Horizon 2020 research and innovation programme under the Marie Sklodowska-Curie (Grant Agreement No. 643050).